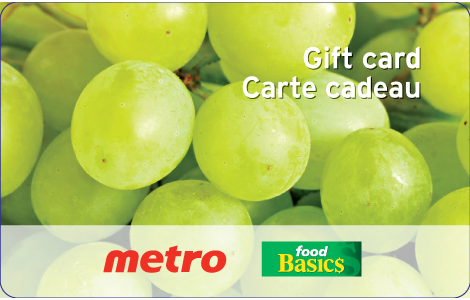 Give the gift of fresh food with Metro or Food Basics gift cards! Use our gift card in one of our 131 fresh stores across Ontario. At A&P, Dominion Ultra Food & Drug and The Barn Markets we serve the freshest products and offer convenient services to customers in an easy to shop environment. We are the only grocery retailer in Ontario to offer AIR MILES Reward Miles on your everyday grocery purchases. Earn 1 AIR MILE Reward Mile for every $20 spent. You can also earn BONUS AIR MILES reward miles on hundreds of items each week. National Gift Card Canada is the best place for you to order Food Basics gift cards in bulk. We are the experts in all things gift cards and can set up your gift card solutions program for you today. Please contact us for more information on Food Basics bulk, direct-to-recipient, or individual gift card fulfillment for your gift card program. Contact us here or call us at 888.472.8747 today! For balance inquiries please see your purchase receipt or the customer service desk. Present this card to the cashier at time of purchase. Use of this card constitutes acceptance of related terms and conditions. This card can be used at any Food Basics or Metro location in Canada. Purchases will be deducted from the value of the gift card until the balance reaches zero. This card cannot be refunded or redeemed for cash. In the event of its loss, theft or unauthorized use, the card will not be replaced or refunded. Card cannot be used for Western Union purchases. Metro Inc. may modify the terms and conditions without notice. Visit foodbasics.ca or metro.ca or for complete terms and conditions. Food Basics and Metro stores are operated by Metro Ontario Inc., a wholly owned subsidiary of Metro Inc.